Across the road, at the Metro Arena, the American punk rock band Blink 182 had attracted a host of fans, many of whom were having pre-concert drinks at The Globe. 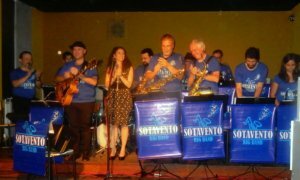 On stage at the Jazz Coop HQ, the Argentinian jazz tango group known as the Sotavento Big Band were ready to unleash their unique brand of swing. The SBB replaces the conventional trombone section with three tenor saxes and the trumpet section with one tenor sax and two clarinets. It sounded strange hearing Basie’s Splanky without the brass but by the time Jumping at the Woodside had been and gone our ears were accustomed to it. Debra Milne, one of the Jazz Coop’s guiding lights, joined the band for Lady is a Tramp and Black Coffee. Debra, who has an affinity for Latin music, was in typical voice only marred by the uneven sound balance – a problem that plagued the whole evening – and I was sitting at the front! The pure jazz was done for this set and the tango took over and with it the dancers. Tanguera was a delightful mix of tango and jazz with the latter proving quite sensual for the dancers. Vocalist Patricia Leguizamon stepped up for City Tango, Romance de Barrio and Nada. Lovely voice but, again, the balance didn’t do her any favours. Upstairs there was more tangoing. Downstairs the second set kicked off with Patricia singing S’wonderful, Bye Bye Blackbird and Sweet Georgia Brown. There was some twiddling going on at the mixing desk which made for marginal improvement, but only marginal. Back to the tango and Años de Soledad; La Oportunidad; Lluvia de Estrellas; La Trampera and La Arenosa brought the show to a close except it didn’t! The audience demanded and got not one but two encores – Volveras Signoras a San Juan (I think!) and Libertango. Director and alto saxist Firmenich wailed on alto with lots of bluesy overtones. Sisneros impressed on clarinet and the rhythm section was on fire. There were also tenor solos although I wasn’t sure who was who. Patricia I’ve already mentioned; she looked good and sounded good, at least from the front row! Despite the sound problems, it was Una noche muy especial!